So said the law given to Moses by Yahweh. But in Jerusalem at the time of Jesus’ birth, Jewish tradition and culture declared that witnesses must always be male. Women were held in such low esteem that they were not allowed to testify in any court of law. They were considered incapable of giving witness in any situation. God, however, had given no such command and was about to refute the prejudice and contempt placed on women by their culture. As Joseph and Mary presented their forty day old infant Son, Jesus, at the Temple according to the law, two witnesses sent by the Holy Spirit appeared on the scene. And one of them was a woman. Simeon, who the Bible calls ‘just and devout’ first took the Child up into his arms and prophesied over Him, giving thanks to God that he had lived to see Israel’s Messiah. Who was this elderly widow we only know as Anna? We know that she was very old, she had been widowed at a young age and that she lived her life in and around the temple in Jerusalem. The Temple covered a very large area and consisted of the sanctuary, courts, balconies, porticos and other buildings. No doubt Anna was a familiar figure around the Temple precincts, most likely ignored as just another old widow as she carried out her prayers and fastings daily against the backdrop of the busy Temple proceedings. But this was no ordinary widow. Luke tells us Anna was a ‘prophetess’, and as is always the case for prophets, most of her life was spent in prayer. Not surprisingly, her prayers were intercessory, petitionary, as indicated by the Greek word “deesis” used here for “prayers”. And we are told this woman SERVED God. 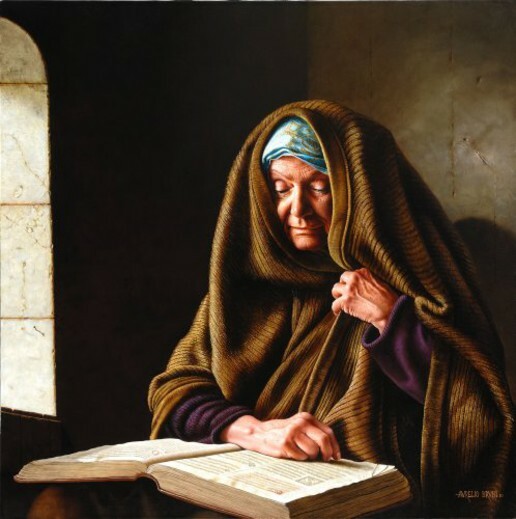 Imagine: while the high priest and his exclusive rank of priests and helpers carried out the daily religious rituals required by Jewish law, here among them dwelt an elderly widowed prophetess, unrecognised, unacknowledged and uninvited. As only He knows how, God was once again confounding the high and mighty by the weak and foolish (1 Cor. 1:27), because among all the traditional ceremony and ritual of Jewish temple life, God had placed one who truly SERVED Him. The honour and privilege of being one of two chosen witnesses to God’s unveiling of the infant Christ that day was given not to a high priest, not to a Levite, not to a man…..but to an aged and faithful servant who just happened to also be a WOMAN. The New Testament tells us that the Law and the Prophets witness to the righteousness of God (Rom. 3:21). That day in Jerusalem, Simeon, the just and devout man who waited for the comfort of Israel (and whose name means “harkening, listening”) was sent into the Temple to represent the law. At the same moment Anna the prophetess was sent by the Spirit to represent the prophets. And God had for Himself two witnesses! Anna, widow, prophetess and servant of the Most High God, chosen by God in all of Israel to give eternal witness to the arrival of His Son on the earth. Luke chapter 2 tells us simply that Anna ‘gave thanks to the Lord’, but the phrase for ‘gave thanks’ more accurately means ‘to agree, or to acknowledge in the presence of’. Anna was sent by God to agree with Simeon and give public witness to who this Infant actually was! After giving thanks to God, we are then told Anna ‘spoke of Him’ (Jesus) to all those who looked for redemption in Jerusalem. Can you hear the ‘I suffer not a woman to teach’ crowd choking and spluttering over that one? Anna taught God’s people about Christ! Man’s culture and tradition said ‘no woman may witness!’ But God Himself said otherwise. It was He who chose and called His servant Anna to be His witness to the coming of the Messiah. It was He who anointed her to ‘speak of Him’. And though religious culture and tradition may still oppose, it is He who still calls His daughters to witness and “speak of Him” regardless of the traditions of men. Please make me feel better about Anna being sent by God to “agree with Simeon.” It sounds like she was just a second, not really there because she was important. God had here there to say what she had to say, not just back up a man. What would be amazing about a woman being a “yes man?” That was what a woman was supposed to do – either that or shut up. The great thing is that Anna spoke up. Scripture does not sound as though she was with Simeon when she did. Yeah, I am a little weird about that kind of thing! Thanks! Hi Cassandra, Thanks for visiting and commenting on this article. I think you’ve missed the point entirely. The article is making the point that God had said that in the Law two witnesses were needed for a matter to be established as truth. Anna was sent to agree with Simeon not for the purpose of backing up a male, but because God desired two witnesses. If you read the statement in the context of the whole article I believe that will become clear. Anna’s role of witness was vital and as valuable as the other witness; she was sent by God as His witness at a time when Jewish culture placed no value on a woman’s testimony. I think God was making a point about the testimony of a woman being of the same value to Him as the testimony of a man. Anna did not need to be ‘with’ Simeon, it was enough that God had His two witnesses to testify that Messiah had come. Her role was not backing up a man, but being a witness, or testifier, sent by God. Again, if the statement is read in the context of the whole article I think this is very clear. A powerful word. I just returned home from the 8 am service and as I sat down to make notes of what the pastor preached out and other areas I sought out on my own, my reading intersected with yours. I thank and I blessed by his spirit. Along with those who share his words freely and openly; and thus free and encourage others to do likewise. Thankyou Daniel. Glad to have you visit us!